The Shenandoah Marlins Aquatic Club, which practices at the Waynesboro Y, competed in the Valley Area Swim Team’s Odd Age Group Meet at James Madison University on Jan 7 and 8. Generally in USA Sanctioned Age Group Level Swim Meets all swimmers compete based on their age on the first day of the meet. The age groups are broken down into 8 and under, 9-10, 11-12 13-14 and 15 and over. In this meet the age groups were switched so the swimmers competed in age groups 7 and under 8-9, 10-11, 12-13, and 14 and over. The following SMAC swimmers participated in the meet: Alexis Brooks (15), Peyton Brooks (11), Bobby Carey (14), Chris Carmagnola (12), Lindsey Carter (15), Mackenzie Carter (12), Maya Chatterson (8), Nate Chatterson (6), Hailey Cook (10), Megan Cross (6), Braelin Fauber (10), McKinna Fitgerald (12), Miles Fitzgerald (8), Grace Hardiman (8), Colleen Higgins (13), Kristen Holman (11), Norah Hunt (13), Caleb Johnson (11), Ethan Johnson (10), Sarah Loomis (11), Hunter McMillion (14), Justin Merritt (14), Jordan Miller (13), Cody Niles (16), Ashley Painter (8), Ella Pickering (10), Ben Prucha (9), John Prucha (7), Clara Riggan (9), Maggie Riggan (13), Charlotte Rumsey (11), Eli Scarbrough (7), Jackson Sherman (7), Hanna Shifflett (10), Tate Snyder (11), Robin Taylor (15), Madison Tegen (15), Logan Terrell (13), Elizabeth Terrell (13), Mattie Tindall (10), Sam Tindall (8), Evelyn Wade (9), Kaleb Wade (11), Nick Wade (14), Kristen Wagner (9), Emma Woodworth (9) Ben Young (8), Libby Young (11) and Luke Young (9). SMAC brought 48 swimmers to the meet and virtually all had at least 1 best time and many swimmers had multiple best times. The swimmers with 4 new personal best times included: M. Chatterson, H. Cook, M. Fitzgerald, C. Johnson, E. Johnson, C. Rumsey, K Wade, N. Wade, and B. Young. E. Pickering, J. Sherman and L. Young had 5 new best times while S. Loomis, E. Woodworth and E. Terrell had 6 best times. Hanna Shifflett led the Team with an amazing 7 new personal best times for the meet. SMAC not only had tons of best times they also won many events. The following swimmers picked up first place finishes: Arnold (Open – 1000 free), P. Brooks (boys 10/11 – 50 breast and 400 IM), M. Chatterson (girls 8/9 – 50 free and 100 IM), Hunt (girls 12/13 – 1000 free), C. Johnson (boys 10/11 – 1000 free, 50 fly and 100 fly), H. McMillon (boys open – 1000 free), J. Merritt (boys open – 200 back and 200 fly), J. Prucha an amazing 8 first place finishes in the boys 7 and under – 25, 50, 100 and 200 free, 25, 50 and 100 back, and 25 breast, C. Rumsey (girls 10/11 – 200 IM), M. Tegen (girls open – 100 back), L. Terrell (girls 12/13 – 500 free, 200 back and 200 IM), N. Wade (boys open – 100 free), K. Wagner (girls 8/9 – 200 free, 50 back, 100 breast, 200 IM, and 400 IM) and E. Woodworth (girls 8/9 – 100 free). SMAC swimmers are now in the process of gearing up for the Virginia Swimming district, regional and state championship meets. These meets will be a chance for the swimmers to show how much they have improved over the course of the year. The meets will conclude the short course season (meets swam in 25 yard pools) for all of the swimmers except those that can qualify for the National level meets. For more information regarding SMAC swimming contact Coach Norm Wright, Director of Competitive Swimming at the Waynesboro Y at 942-5107 or email him at normw@smacswimming.org. 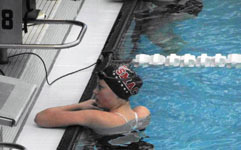 For more information about SMAC, visit their website: www.smacswimming.org. Above Left: Elizabeth Terrell (13) starting the 100 backstroke. Above Right: Madison Tegen (15) after finishing 500 free.